Save the date for our annual Silent Auction and Dinner! All proceeds go to the Bethesda Mission, home of our student run free clinic. 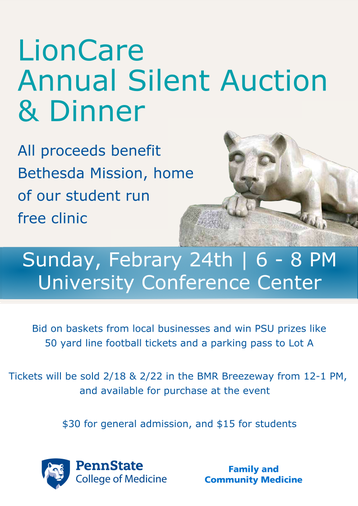 Come and see what our volunteers have accomplished over the past year, bid on baskets from local businesses, and win special Penn State Prizes! Like PSU football? Bid on 50 yard line tickets. Are you a student or employee tired of making the hike from Lot A1? Bid on a Lot A parking pass and walk straight in the door! If you'd like to donate a prize, or have any questions, please email lioncare.psu@gmail.com. Purchase at the door, or in the BMR lobby from 12 - 1 PM on 2/18 or 2/22. Cash or Venmo accepted.